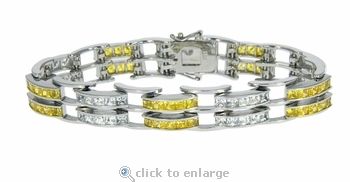 The Saxony Duo Channel Set Princess Cut Cubic Zirconia Bracelet highlights a contemporary pattern with 100 alternating canary colored and diamond look channel set 3mm each princess cut cubic zirconia squares for a total of 20 carats in total carat weight! Our Russian formula cubic zirconia is hand cut and hand polished to exact diamond specifications for a stunning finished product. This unisex bracelet features two flexible rows of links with an approximate width of 11.5mm and a double hinged safety clasp to secure the 20 carats of pure bling! The alternating stones are available in various stone colors that include man made ruby red, sapphire blue, emerald green or canary yellow, pink or diamond look cubic zirconia. This bracelet comes standard in 7 inches and an 8 inch length is offered as an upgrade, please see the pull down menu for options. For further assistance, please contact us directly at 1-866-942-6663 or visit us via live chat and speak with a knowledgeable representative.